Run the Java simulation (for Java-enabled browsers and monitors with desktop areas at least 800x600 pixels). There is a picture with instructions for this simulation. 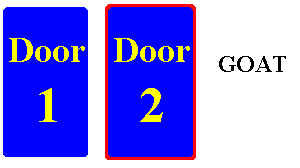 In a certain game show, a contestant is presented with three doors. Behind one of the doors is an expensive prize, behind the others are junk (or goats). The contestant is asked to choose a door. The game show host, Monty, then opens one of the other doors to reveal a junky gift behind it. The contestant is then asked if she/he would like to stick with the original door or switch to the remaining door. Does it matter, i.e., could you flip a coin to decide?